Peterborough Greyhound Stadium is located less than a mile from the city centre of Fengate in England. The stadium's grandstand has recently been extended. Peterborough Greyhound Stadium has five bars, a restaurant, a fast-food center and a cafeteria. The stadium's tiered seating arrangements provide an unobstructed view of the thrilling racing action. It also has two self contained corporate suites and a trackside function suite. The lighting system of the racetrack was recently upgraded to state of the art floodlights that enhance the spectacle of evening racing. Races are normally conducted every 15 minutes; Peterborough Greyhound Stadium plays host to England's major competitions. Peterborough Greyhound Stadium is located at First Drove, Fengate, Peterborough, England. Peterborough Greyhound Stadium opened in October, 1930. In 1945, Reg Perkins and George Ellingworth purchased the stadium. During this time, the hare was pulled around the track by two men using an upturned bike. The stadium currently uses a Swaffham-McGee type hare. When Ellingworth died, Perkins took complete control of the stadium. Perkins retired in 1977. Today, Rex and David, Reg Perkins' sons, manage the stadium. On March 24, 1999, a fire severely damaged the stadium's grandstand and an adjoining warehouse. 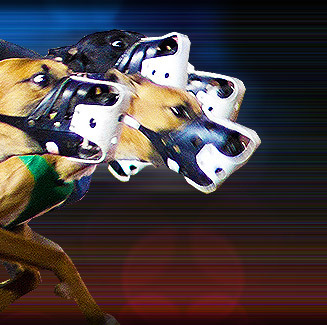 greyhound racing was postponed for six months as repairs and refurbishments were made. In the summer of 2003, a £3 million extension increased the length of the grandstand from 301 feet to 518 feet. Peterborough's race track surface is silicon sand. Up to 15 tons of salt is used during the winter months to prevent the track from freezing. During the summer, when there is no rain, the track is watered for up to three hours each day using £2,500 worth of water per year.